Victims Dorvil and Lottie Ramsay. Image courtesy of the Ramsay Family. Enhancement by John Van Horne. For nearly a century, two painted crosses on Sugarloaf Mountain in Campbellton, New Brunswick, Canada, have been a not-so-subtle reminder that life can vanish in the blink of an eye. On a frosty evening in the fall of 1924, local sisters Dorvil [Ramsay] McLean and Lottie Ramsay took the worst possible route down the 1,000-foot high extinct volcano — the North face. The young adventurists paid the ultimate price, plunging to their deaths. They died instantly. Dorvil [left] was 22; Lottie [right], a few years younger. Sunday, November 9, 1924. A light blanket of snow was making a trek up the Sugarloaf a bit tricky. The large rocks on the trail were slippery; someone could easily slip and get hurt. 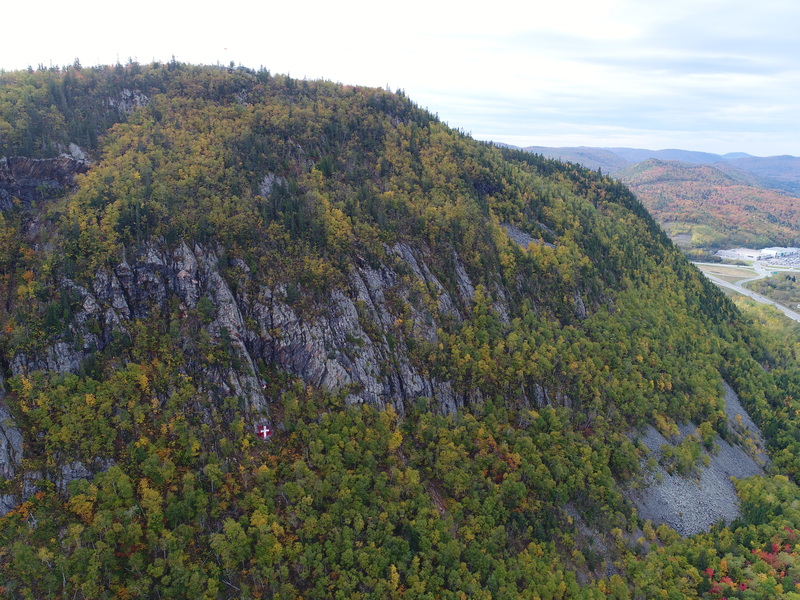 It was around four in the afternoon when Dorvil and Lottie set off to climb one of New Brunswick’s best-known peaks. They used a trail that snakes up the eastern spine of the mountain, the same route hikers use today. Darkness was fast approaching when the Ramsay girls stood on the highest point of the Sugarloaf. It was also a tad chilly — but the view … aaah! … postcard-beautiful! As always. Spread out beneath them were the twinkling lights of Campbellton and area. We’ll never know what possessed the pair to climb down the face, a high-risk venture at the best of time. We could analyze and parse this for eternity but, bottom line, no one can say for certain what happened that fateful evening. Nobody saw the sisters fall and, far as we know, no one heard the screams. That’s because there was just no one about. The area around the Sugarloaf wasn’t developed like it is today. What it all boils down to is that key information is missing — and will always be missing — because there were no witnesses and too much time has passed. Dorvil [Ramsay] McLean, married just 14-months before, had a seven-month old boy at home. Little did the young mom know, but she would never see her baby again. If you believe in a Heaven and a life beyond, there would be a mother and child reunion in the 1940s. More on that coming up. When Dorvil and Lottie failed to show for supper, their parents, Jane and Sydney, sensed that something was amiss. Jane was a stay-at-home mom, not unusual back in the day. Sydney was a railway fireman who earned his paycheque the hard way — by shovelling coal on the old steam locomotives. The girls came from a large family. They had six siblings — two sisters and four brothers. Understandably, there was tension at the Ramsay household at 15 Hillside Street, down by the train tracks. Mom and dad had no idea where their girls were … and not knowing was giving them fits. A younger brother was given ‘a few cents’ and told to leave the house for a spell while the adults tried to make sense of things. When Dorvil and Lottie failed to return home that evening, it was clear something had gone terribly wrong. Around 10 o’clock, a group of men — armed with flashlights and high hopes — went looking for the girls. No luck. Where the heck were they?? Dreading that proverbial knock on the door, more than one family member paced the floor that night. However, their prayers were for naught. The girls were already in Heaven. No one slept well that night. When the sun came up, a small search party set off to find the Ramsay girls. Four men reached the top where they picked up their trail. Following a set of footprints in the thin layer of snow, searchers gingerly made their way down the face. The trail zigzagged here and there, as though the girls didn’t know where they were going. About halfway down the mountain, hearts sank when the trail ended at the edge of a steep cliff. The men peered over the side and called out. There was no response, and so they called out again. The silence signalled they were no longer on a rescue mission but a recovery mission. Hundreds of feet below, three more members of the search team — policeman William Smith and two civilians — Mr. J.H. Moores and a Mr. Gay — located the cold, battered bodies. According to a 1924 story in the Campbellton Graphic, the first victim found was Dorvil McLean. Her remains were located among the rocks. Her sister’s body, a short distance away, was caught on a tree. The bodies were wrapped in blankets and carried down the mountain. A grim-faced police officer then went around to the Ramsay house and gently tapped on the door. He had some heartbreaking news no parent should ever hear. There was no autopsy. “No need,” according to the coroner, a Doctor Martin, who quickly came to the conclusion the girls died from acute head injuries. Dorvil and Lottie Ramsay’s tombstone can be found in the sprawling Rural Cemetery in the West end of town. Little is known about Dorvil and Lottie because the accident happened so long ago. But there’s another reason. Family members — especially Mom and Dad — simply didn’t want to talk about it. Their pain was so deep. Death certificates shed more light on the girls … and how they perished. Cause of Death: ‘The skull was fractured in many places, making [a] lot of compressions.’ Translation: massive head injury. 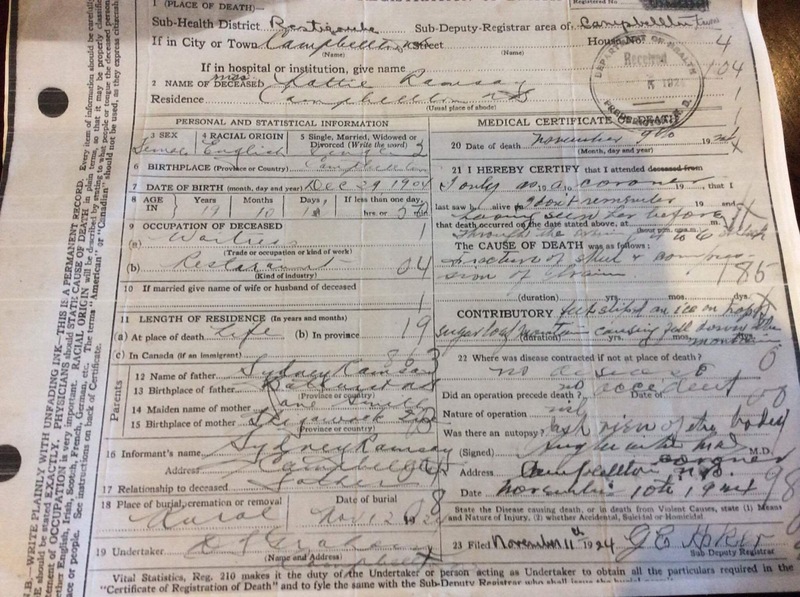 Lottie Sarah Ramsay’s death certificate lists her occupation as restaurant waitress. Lottie, who was also born in Campbellton, was single. Incredibly, Lottie has three different birthdates. 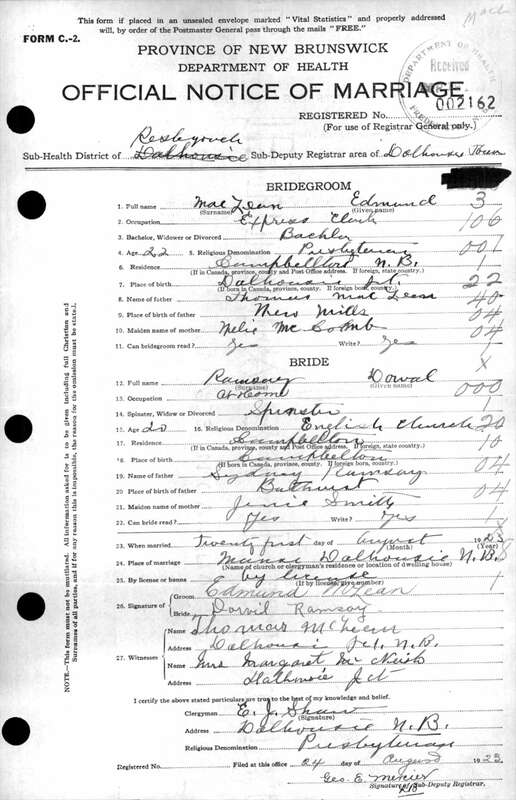 Her death certificate [see below] shows 1904. 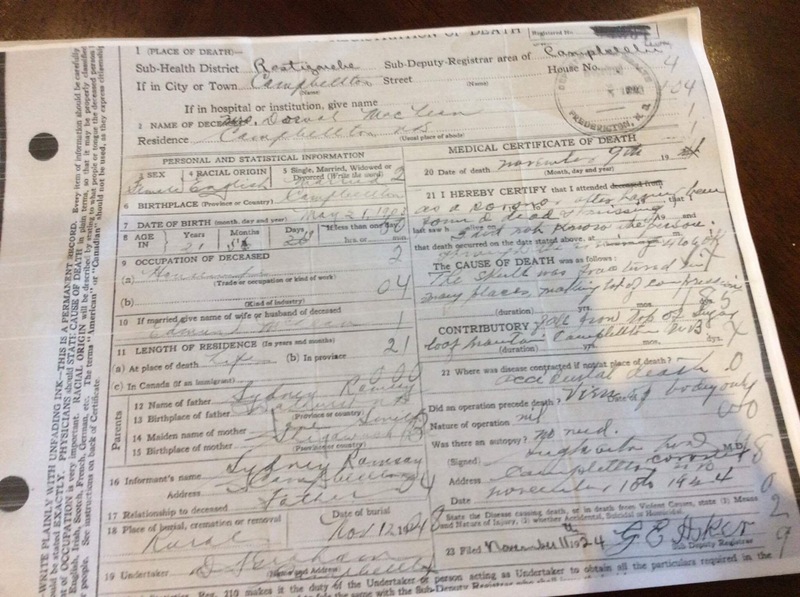 Her birth certificate indicates that she was born in 1906. However, Lottie’s tombstone [see photo above] lists 1905 as the year she was born. Take your pick. Back then, vital stats — including the correct spelling of names — apparently weren’t a big deal. It’s interesting the good doctor came to that conclusion. Could it be that someone — perhaps the coroner or a police officer — spoke with those who’d followed the girls’ tracks to the edge of a cliff? As part of an investigation, members of the search party were likely interviewed to help determine if the deaths were an accident … or the result of foul play. That’s standard procedure nowadays and I suspect things were no different back then. Rumours of the girls being ‘chased by a bear’ … hmmm … perhaps not. Bears had been in hibernation for a month when the girls fell to their deaths. And if a bear was not in its den that particular evening — for whatever reason — it would have been scrounging for food and water, and there wasn’t a lot of that at the top of Sugarloaf Mountain. And keep this in mind. No one saw bear tracks. Dorvil’s Death Certificate … click to enlarge. Lottie’s Death Certificate [both documents courtesy of the Ramsay Family] Click to enlarge. Some have speculated the girls may have been alive for a while after they hit bottom. Given the severity of their head injuries, that’s very unlikely. Owing to the long drop — we’re talking hundreds of feet here — Dorvil and Lottie were most certainly unconscious within seconds and dead within minutes. Their parents, Jane and Sydney, were forever in mourning. The same could be said for many in tight-knit Campbellton where everyone seemed to know each other. One can only imagine the number of prayers that were whispered for the two girls. Then and now. A young waitress and a stay-at-home mom have become some of Campbellton’s best-known citizens — because of how and where they died. They’ll never be forgotten, that’s for sure. 300 years from now, people will still be talking about the Ramsay girls … more so than any Campbellton politician, soldier, doctor, sports hero, ship maker … you name it. Alex Johnson went beyond making devotions. On Thursday, May 28, 1925, the former World War I sniper took aim at creating a unique memorial for his friends. With the help of his older brother, Seely, the 26-year-old made his way up the mountain, carrying gallons of white paint. He then pulled out a brush and began painting two rock surfaces. It was a full day’s work. 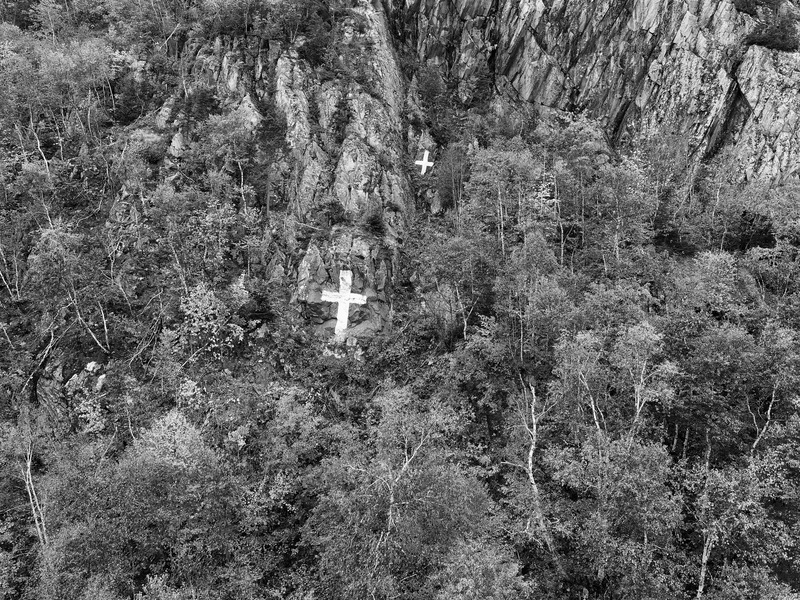 Next morning, people in Campbellton woke to find a pair of crosses on their mountain. Everyone knew what they were about. The paint was a gift from Alex and Seely’s father, a Norwegian immigrant who ran a painting business in town. His sons provided the manpower. Alex also provided some form of closure — not only for himself but for everyone in Campbellton. It was a labour of love. Alex continued to paint the crosses on his own time — without any compensation. That’s how things got done back in the day. Angie Johnson recalls her father talking about the ‘great sadness’ in town when the girls lost their lives, and that he wanted to do something special so they would never be forgotten. The result was a one-of-a-kind memorial that could be seen for miles. In an ironic twist, the photo of the Ramsay sisters [above] shows both wearing tiny crosses. 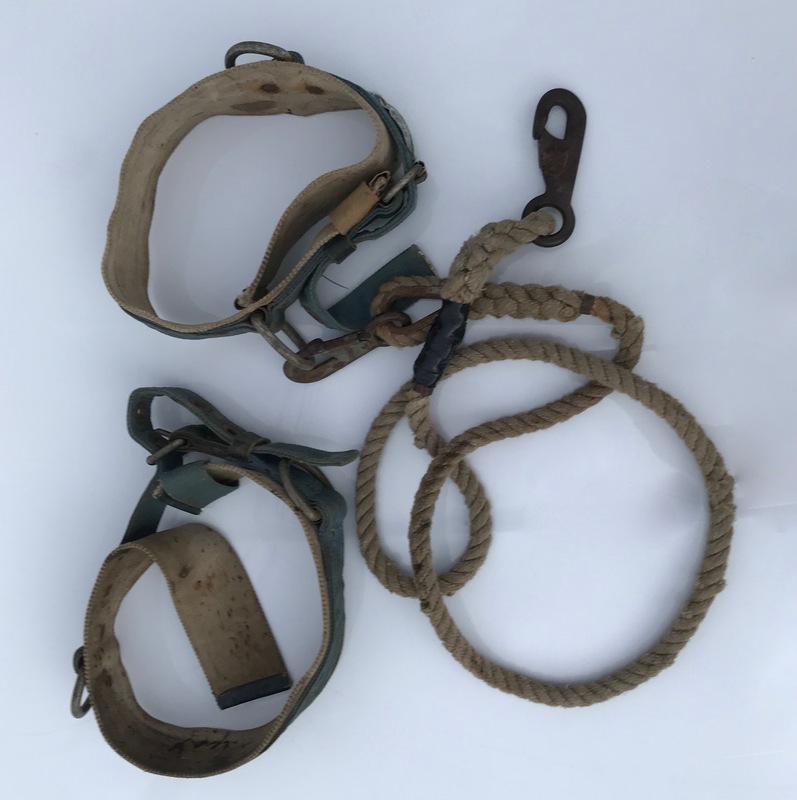 Thanks to a sturdy leather harness, Alex Johnson was able to paint the memorials without getting hurt or becoming a fatality himself. Perhaps it didn’t occur to Alex at the time — although maybe it did — but his crosses have saved lives and injuries simply by being that constant reminder. A novice climber will think twice about scaling the north face. No one wants to be that third cross. Irene Doiron, who now resides in a senior’s home in Campbellton, liked climbing the Sugarloaf with friends when she was a kid. But her mother was worried she’d get hurt and so to discourage Irene from climbing the mountain, she showed Irene a scrapbook containing newspaper stories surrounding the deadly accident. Johnson, a founding member of the Royal Canadian Legion in Campbellton, died in 1997. He was 98. The man who initially painted the crosses on Sugarloaf Mountain is buried in the same cemetery as Dorvil and Lottie Ramsay. The large crosses didn’t go over well with the Ramsay family, especially the mother. That’s understandable. Seeing the crosses day in and day out was a painful reminder for Jane that her two girls were never coming home. Dorvil had married when she was 20. Her husband, Edmund, was 22. The young couple took their vows on August 21, 1923. They hadn’t been married 18-months when Dorvil perished. Dorvil and Edmund had one child, Sterling [Edmund] Sydney. Edmund Junior never knew his mother because he was only half a year old when she made that fatal trip up the Sugarloaf. Before Edmund could finish high school — like so many teens in the day — he signed up at a military recruiting office in Fredericton where he was given a new army uniform. The youngster was soon on a ship crossing the Atlantic Ocean for training in England and to fight in the ‘European Theatre’ of World War Two. Trooper McLean [Reg # G3906] ended up with the 28th Armoured Regiment [tanks], based in British Columbia. And like so many teens and young men, Junior never came home. 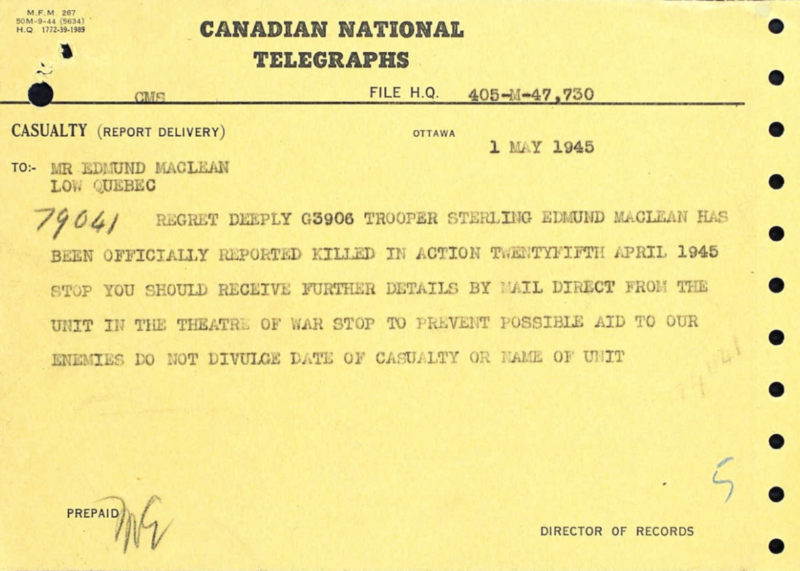 Trooper McLean was killed on April 25, 1945 in Friesoythe, near Bremen in northwest Germany … just days before the Nazis surrendered. Like his mother, Edmund Junior died young. He had turned 21 about a week earlier. McLean is one of 1,382 soldiers interred in a Canadian War Cemetery in Holten, Netherlands, about two hours’ drive from where his tank exploded. McLean is buried with a group of young soldiers in a corner of the well-kept cemetery. When I say ‘young,’ their ages ranged from 19 to 26. Seems like a misprint, doesn’t it? 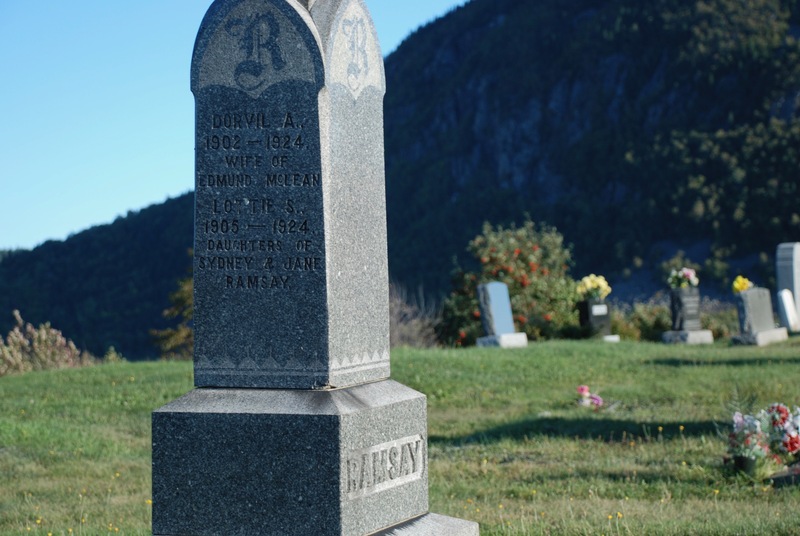 On the tombstone of Dorvil Ramsay’s son, however, there is no personalized tribute — only a cross. Sterling Edmund McLean was engaged to a young woman living in a four-story apartment building on Pierce Street in downtown Montreal, in the shadows of Mount Royal. Evelyn Gallant paced the floor in her unit, terribly worried about Sterling. She hadn’t heard from her fiancé in a while. His censured letters from Europe had stopped. To find out what was going on, she wrote to Army Headquarters in Ottawa. Click on her short letter [lower left] to see what she had to say. The mailman soon arrived carrying an envelope from the military. Now Evelyn Gallant would know. She tore open the envelope and read the letter. Her worst fears were realized. The young woman burst into tears. As the country song goes, war is hell on the homefront too. 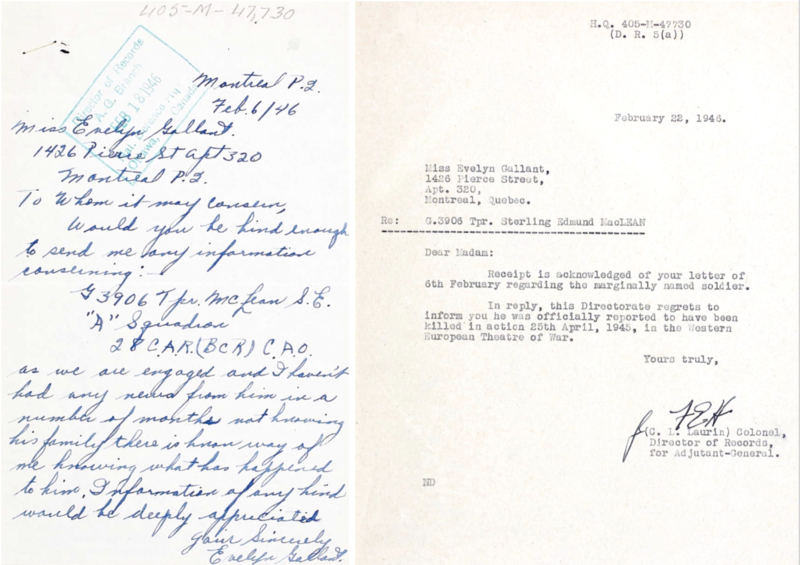 Documents courtesy of Library and Archives Canada. Here’s a short video clip [:25] showing the rugged rocks where the girls fell. Click on the arrow to view it. The clip will appear in 720p quality, which is okay … but nothing to text home about. If you’d like to watch it in higher definition [1080p, Blu-ray], first click on ‘SHARE’ [top right corner], then click on either ‘ORIGINAL’ or ‘MP4.’ You should be good to go. It’s always hard to imagine what life was like before we were around. But through popular songs from the “Roaring ’20s” [specifically 1924] … and some key events from that year, we can get a ‘feel’ for what life was like back then. 1924 was the year Prince Edward Island switched driving from the left side to the right side of the road … the Royal Canadian Air Force was formed … Prime Minister Mackenzie King made radio history by broadcasting the first federal speech … and in hockey at the first Winter Olympics in Chamonix, France, Canada [represented by the Toronto Granite Club] beat the United States 6-1 in a testy, injury-filled game. Some things never change. On Thanksgiving Sunday, October 7, 2018, Campbellton area women Rose Beek, Monique Boudreau and Gina Menzies attached red flowers to the main cross. It was their way of paying tribute to the Ramsay girls. Boudreau and Menzies are also cancer survivors. They climbed to the crosses with a clear message: mountains, like cancer, can be conquered. 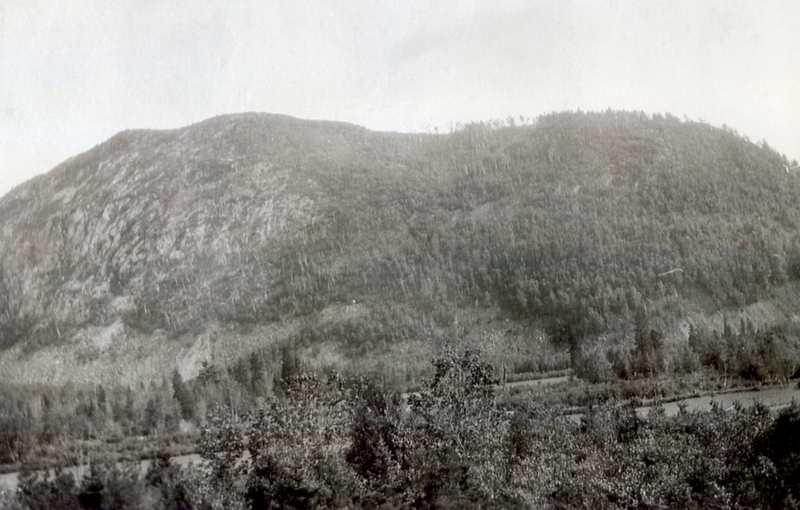 A view of the Sugarloaf in 1927. 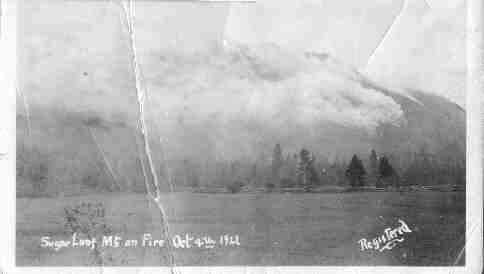 Owing to a fire, there weren’t a lot of trees at the eastern end of the mountain. [Photo courtesy of Edie Power] Click to enlarge. Angie Johnson, Alex’s eldest daughter, now in her 70s, lives in the small house her father built on Aucoin Street in the west end of Campbellton. When Angie relaxes on her south-facing balcony, overlooking the mighty Sugarloaf, she thinks about the two Ramsay girls … and her dad, the painter. At the time, thousands reflected on the two crosses Alex Johnson painted so many years ago now. It’s safe to say his artwork has now been seen by millions. Now that’s a tribute. Well done, very good read. Thank you. I would like a story on The Van Horne Bridge. I remember us playing underneath on the catwalk during construction. What a nice revisit. Wow, What a story. I always wondered what was the truth behind the crosses on the Campbellton Sugarloaf Mountain. Now I know. No more is it a mystery to me and many others. This is absolutely a wonderful recollection of what’s behind the two crosses! I’ve lived in Campbellton till 1979 prior to university and honestly had no full understanding of all the facts behind the tragedy. Thanks for sharing and again showing why Campbellton is a great humanitarian city! 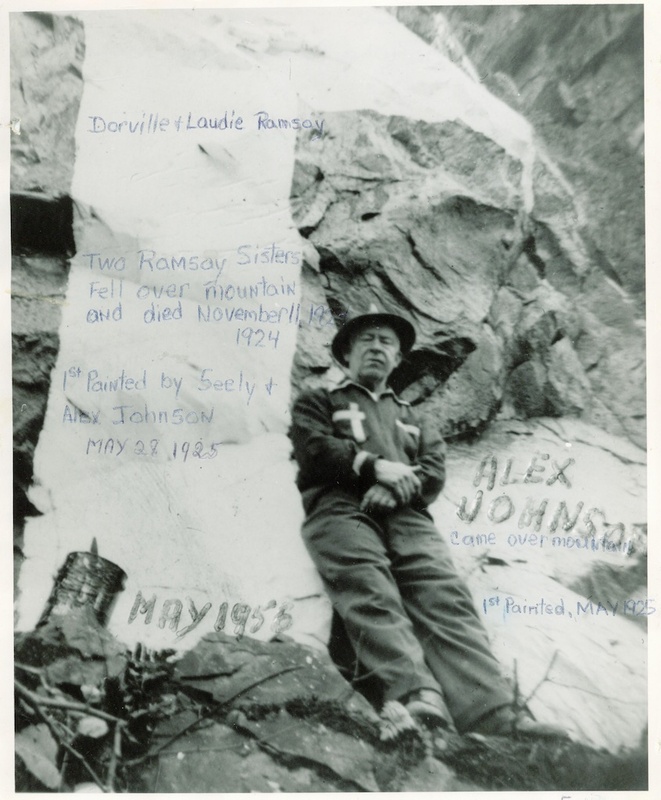 John Ross, born in Campbellton now lives in Miramichi with his cousin Jack Miller, who lives in Fredericton, climbed the path on the eastern side of the mountain in August 1951 … had a picnic there. Beautiful view of Campbellton. Thank you to the person that posted this article. Wow. That is truly an in-depth look at the two crosses. It’s nice to be able to get so much information about them. Very well done. Climbed the mountain many times in 1960’s and 70’s. The last part of east side path was a rock climb. Also remember the path in woods from Brookside to the mountain. Always thought it was spooky in there. Would like to see more history on my hometown. I enjoy your articles and images whenever they come up on my Internet horizon. Keep up your fine work! Best regards from a fellow Campbelltonian now living in the balmy South at sunny Shediac. I lived in Campbellton for 6 years and did not know this story. My brother and friends climbed Sugarloaf but not I. We used to climb the Sugarloaf often as kids in the 1960s. Our family always talked about the Ramsay sisters, telling us to be careful going up there … and to watch for the bears. Thank you for sharing so many more facts. Interesting read. Thanks for again writing a great article about our hometown. My Mom had told me some of the story about the Ramsay girls when I was a child as I wondered what those crosses were all about. Beautifully written. You tell the story with heartfelt sincerity, a poignant tribute to the girls, their family and their place in the history of Campbellton. Thank you. Having lived the first 19 years of my life in Campbellton, I’ve always wondered about the significance of the two crosses painted on the face of the Sugarloaf … now I know the facts. Amazing fact finding. Very impressive. A little history about the Sugarloaf Mountain crosses in New Brunswick! Have been going up the mountain a few times a week for the past 40 years and although I knew the crosses represented the deaths of the Ramsay sisters it was nice to read the actual story. By the way, 22 years ago I took my daughter [who was around 13 years old at the time] up to the crosses. It wasn’t the smartest thing I ever did and was reminded often by the mother. We were able to touch the large cross but couldn’t reach the small one. I remember moving to Campbellton in 1971 and being told the story of the crosses. I read this article and it still breaks my heart. What a tragedy. I’ve always wondered why they would go up the mountain at that time of year and that late in the day. I remember this story and looked it up at the library … a great tragedy for the Ramsay family. I lived on upper Lansdowne Street and our house faced the mountain so I saw the crosses everyday. As children, we climbed the mountain often; some of the boys used to climb the face. I was good friends with Linda Johnson and I know her family was proud of their father for painting the crosses. Thanks for a well-written story. I was born in Campbellton in 1927. I grew up hearing the account of the Ramsay sisters. I worked on the CN Railway for 37 years. I knew both Alex and Elmer Johnson. They worked for B&B (bridge and builders). I also knew Syd Ramsay — and knew the police officer that went to the place of the tragedy. My brother and I chummed with his son. For something to do in those days, we ran up and down the path to the top of Sugarloaf Mountain. We timed it to see who could run up and down the fastest. It is a great article on the story of the Ramsay sisters … it is good to let the younger generation know a little of the history of Campbellton. Well done. Great and moving story. Thank you. This is a wonderful article, Byron. You have a great gift for storytelling and bringing this tragedy to life for today’s generation. I knew the basic facts of the story but not in such detail – great research! Thank you for taking the time to prepare this thoughtful empathetic account. I have climbed the mountain a few times too, but never had the nerve to go up the north face – the gradual trek on the east side was plenty challenging enough for me. I doubt I could climb the Sugarloaf at all these days, even on the path. Last time I was up was about 30 years ago with my friend Charlotte, another teacher. But we were a lot younger. Even then I had to catch my breath many times, and that last 100 feet of sheer rock was a devil to climb. But a beautiful view from the top. That day, as we were sitting there puffing and getting our breath back, we saw a couple of little heads appearing over the north face — two boys no more than 7 or 8 years old who had climbed up the front of the mountain collecting pop and beer cans/bottles — if you can believe it. All of a sudden, our accomplishment withered in comparison. Very nice for you to share their story. My mother use to tell me about the two girls that fell but now I have names to put with the story. Thank you. It was a wonderful and educational read. Thank you, excellent article … keep them coming … love to read about our Campbellton history. I am told that the Ramsay sisters are distant relatives on my father’s side. I have nothing to substantiate this of course. Thank you for this amazing article. Each time I read it, I understand your interest. You are such a wonderful advocate for this area we call home! Thank you for the in-depth story of the crosses that I used to see every day from my house on George Street in Campbellton. I knew they represented two deaths, but now I know the complete story. All my life I heard that the two girls had a fight because one sister was sleeping with the other one’s husband. Has anyone else heard this? I love all the articles you write … not having moved far from home, I get to see the Sugarloaf all the time. I remember as a child our parents telling us this story — not in detail like you wrote it — but basically the same. We climbed the mountain many times on Sunday afternoons … sometimes 30 of us with our brothers looking out for us. Thank you once again for a great story. I look forward to your next. So special to be able to discover such detailed information and see new pictures, thank you so much! I have heard various versions of this story over the years. It is so nice to read this detailed version. Amazing work putting this together. I appreciate this so much. I am so happy to see the updates that were added. Opens up more of the mystery for the people that live here in Campbellton. Great job!